DodgeIntrepid.Net Forums - Dodge Intrepid, Concorde, 300m and Eagle Vision chat > DodgeIntrepid.Net Main Forums > General Discussion > First Generation How-To's > Can't find the flasher relay???? You'll have to pull the panel off the bottom off the dash and the air conditioning duct to get access. I'm not sure of the color but believe it's black. Someone else could probably confirm that. Thank you so much. I got the flasher relay changed. Now I have front hazards and turn signals but no tear hazards or turn signals? Where did you buy the flasher? 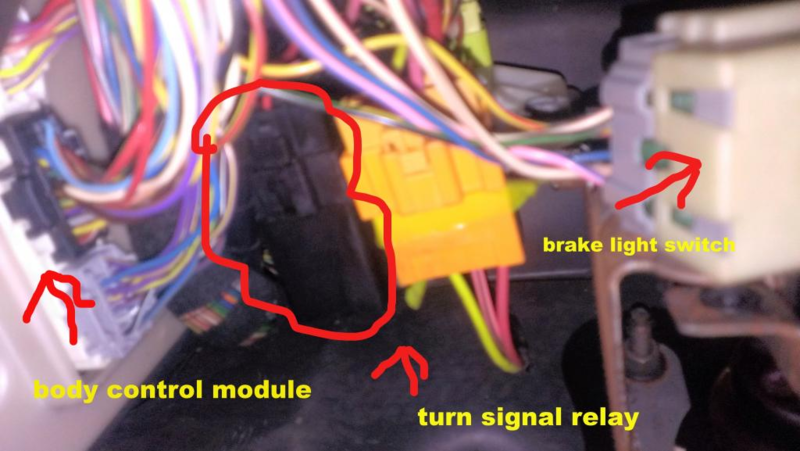 There are no computers or relays between the front and rear turn signal bulbs - IOW, If fronts are working and rears are not, has to be a wire, connector or bulb issue (both bulbs blown?). Flasher - under dash - remove driver’s side knee bolster. It’s on a panel with some connectors. It’s black - towards bottom left of that panel IIRC. Flasher can be difficult to remove. Most people abandon it in place and pull the connector off and plug in the new flasher and zip tie it to some nearby wires. But if you remove the screw that attaches that connector panel to the underdash structure, you can stick a screwdriver into the latch slot that secures the flasher to that panel to unlatch the flasher and remove it. Most aftermarket flashers, even though listed for our cars in the applications lists, do not work properly on our cars - some even blow one of the fuses every time you use the hazards. Best to get the OEM flasher from the dealer or from a junk yard. Wiring diagrams are in section 8W. Includes diagrams showing PDC and Junction Block fuse numbering (secs. 8W-10 and 12). Also this is in the First Gen Section (1993-1997) maybe it can be moved to the Second Gen section (1998-2004)? The car being discussed is a 1999. Since this wasnt responded to lately..